Purple, a Utah-based mattress startup, announced today it will merge with Global Partner Acquisition Corp (GPAC) in a deal that would value the company at $1.1 billion. Purple was already well on its way to that valuation when we got to take a sneak peek at operations at the company’s headquarters in the small town of Alpine, Utah and its giant factory an hour away in rural Grantsville last April. The new deal is known as a “reverse merger” and would result in Purple becoming a publicly traded company overnight, but without the formal IPO process. High Times pulled something similar today when it sold itself to an already public special-purpose acquisition company called Origo. GPAC is the same type of setup, but owned by a number of financial management organizations. At the close of this transaction, GPAC will add $90 million to the company coffers and take a 14 percent stake in the company. 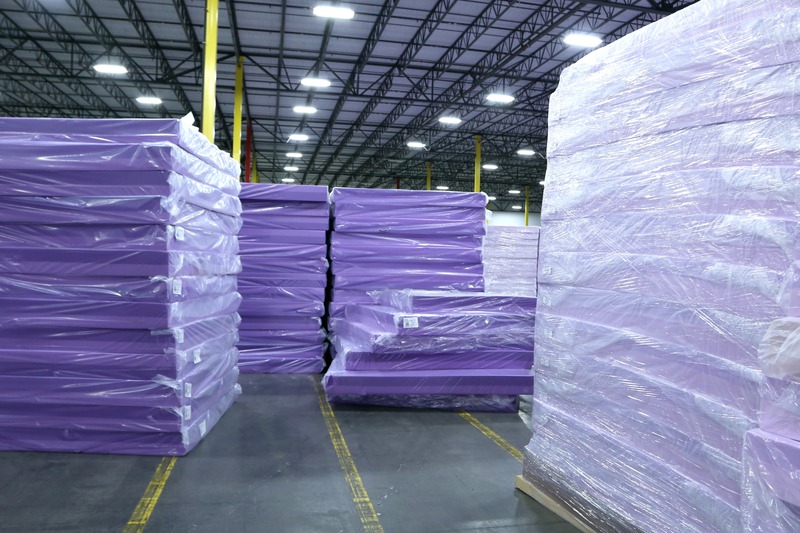 Thousands of Purple’s mattresses stacked up inside the new 574,000-square-foot warehouse. About a decade ago, founders and brothers Tony and Terry Pearce bootstrapped the company, building it up from a wheelchair business to the thriving direct-to-consumer mattress company it is today. In just the last year Purple went from a team of 30 to 600 people, built out an enormous manufacturing facility the size of eight Walmarts and more than tripled its net revenue. The brothers still own a sizable stake in the company and are estimated to take home $850 million when the deal is done. Top execs of the company were reportedly shopping Purple around and trying to raise funds to help it scale a fast-growing business for a number of years but weren’t ready to jump into bed with just anyone. There’s good reason for that. According to Purple’s investor deck, the company is on its way to pulling in $187 million in net revenue this year, more than triple the $50 million it made in 2016. The revenue is just a drop in the bucket compared to the entrenched $15 billion mattress industry, but it shows the dent Purple and other bed-in-a-box startups like Casper and Tuft and Needle are starting to make. The new deal allows the brothers Pearce to maintain control of the company, with CEO Sam Bernard at the helm. The company said in a statement today it would be “pursuing partnerships and opportunities to support its multi-channel distribution strategy,” including an on-going test with brick-and-mortar outlet Mattress Firm, which has approximately 3,500 locations across the U.S.
Of course the deal isn’t done and both parties can still walk away at this point. However, GPAC CEO Paul Zepf said his firm was “excited” by Purple’s financial model and that it, “displays a unique combination of growth, scale, and profitability. We are pleased to partner with Terry, Tony and Sam and look forward to their continued leadership of Purple,” he said.